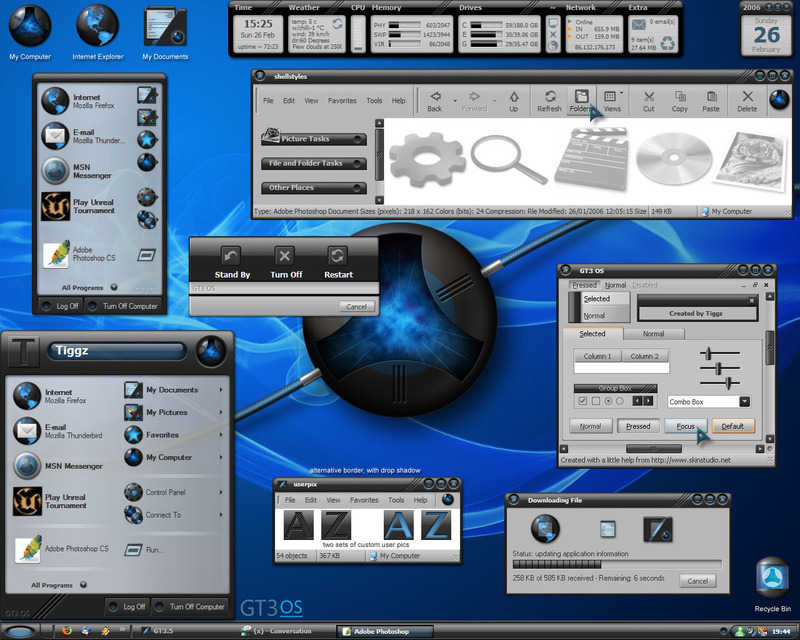 Windowblinds skin to accompany the GT3 OS suite of skins. A clean, light skin designed for everyday use. Taking the GT3 original and expanding on the idea of a light substyle and substantially rebuilding it to ensure maximum useability and compatibility. My choice to have the non-per-pixel borders as the main style is because I found that using per-pixel borders comes at a price. One of my favourite features in a WB skin is the pin-on-top button, which is not available with per-pixel borders. Other implications of having per-pixel borders are no button sounds and unskinned menu bars. For original GT3 skins please visit Link - The GT3 icon set and cursors work well with GT3 OS. This is so nice,Good job. Just wondering...will there be a matching boot? This is simply perfect. You did it again, Tiggz. You are the best Matt. Oh boy, Tiggz has uploaded his new skin and the servers break down. Seems that all of us are trying to download at the same time. First class, first rate work. This was the first WB skin i ever downloaded and i loved it, but it dident last long cos it was to dark for me to use every day. thanks for sharing awsome job!!! Excellent, marvelous, beautiful and a whole bunch of other things I would like to say, but for the sake of decency, I will forestall. Thanks and thanks. Suite of inimitable quality, impossible to classify it. Thoroughly awesome (as always ). This is a stunning update to GT3. Great compliment to the other GT3 skin. Where do I put this userpix folder? Thanks Tiggz- I have all of this series, from GT2 through OS, and this is the best. Tiggz is a freakin' GENUIS!